Suzuki's DF2.5—Small in size but big in features. 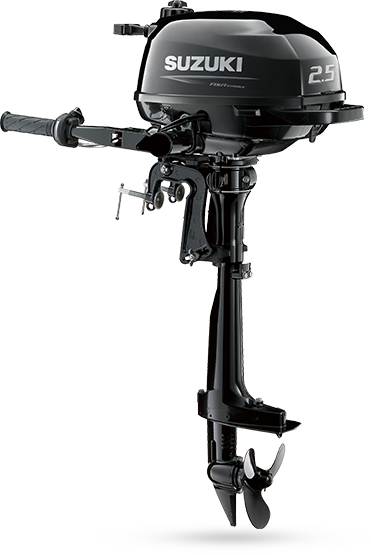 An outboard designed with user-friendly features, is an outboard that lets you enjoy more of your time on the water. That's why the DF2.5 is equipped with a twist-grip throttle for easier operation from different sitting positions, and full-turn 360° teering, which is advantageous when maneuvering in tight places and also delivers superior thrust when backing. Operation is quiet and smooth, and the engine is water-cooled for increased durability and dependability. And a large capacity integrated fuel tank holds one-liter of fuel, which provides an estimated operating time of almost an hour on a full tank. Other features include steering and throttle tension adjustor systems, F-N shifting located on the starboard side just where you'd expect, and an oil level indicator conveniently located on the port side for easy oil checks. Removed from the boat, the DF2.5 is balanced, lightweight, and easy to manage due to its large carrying handle. The integrated handle is located on the back of the engine cowling where it also assists when tilting the engine. And there's four-position tilting for matching the outboard with individual boat and operating conditions. Suzuki's four-stroke technology squeezes more from every tank of fuel than a comparable two-stroke outboard. Four-stroke technology also delivers clean operation that allows the DF2.5 to gain CARB 3-Star Certification for Ultra Low Emissions by the California Air Resources Board.